‘Mrs Gaskell’ – as contemporary readers knew her – was unusual among 19th-century female writers, balancing her career with an active family life with her husband and four surviving daughters. Throughout her career, the author proved equally unconventional, exploring contentious issues in society in her writing, while her pioneering and allegedly libellous 1857 The Life of Brontë is now considered to be one of the greatest English biographies. Born in London to former Unitarian minister William Stevenson and farmer’s daughter Elizabeth (née Holland) on September 29 1810, Elizabeth Cleghorn Gaskell started life in what is now Cheyne Walk, a London street steeped in cultural history. Over the years, this famous Chelsea address has also been home to number of other famous Britons, including authors George Eliot and Henry James and Pre-Raphaelite painter Dante Gabriel Rossetti. However, Gaskell’s association with the capital was short-lived. Following the death of her mother just over a year later, Gaskell moved to live with her aunt, Hannah Lumb, in the Cheshire market town of Knutsford, which later became the inspiration for the fictional town of Cranford. Her “dear adopted, native town”, as she described it, is justly proud of its most famous inhabitant. The Mediterranean-style Gaskell Memorial Tower, built by wealthy glove merchant Richard Harding Watt in 1907 as a tribute to the author, dominates the main thoroughfare of King Street, while Aunt Lumb’s Heathwaite House sits in what is now called Gaskell Avenue. To help bring Gaskell’s most famous work to life, Knutsford Heritage Centre provides visitors with leaflets for a Cranford-themed walk and runs guided tours throughout the summer. Despite her affections for her adopted town, love then led ‘Lily’ – as her family and friends knew her – to the industrial heartland of Manchester. After marrying Reverend William Gaskell at St John’s Parish Church in Knutsford in 1832, she moved with her husband to the city, where William preached at Cross Street Unitarian Chapel. As a charitable minister’s wife, Gaskell witnessed the tragic deprivation of the city’s mill workers first-hand and vividly described their bitter resentment of the Victorian middle class in her first novel Mary Barton, opening the eyes of readers and provoking discussion of the harsh plight faced by the lower classes. The author had endured her own hardships, when in 1833 she gave birth to a stillborn girl and later an unnamed boy who died. Tragedy struck again in 1845 as she and William enjoyed a family holiday in Snowdonia with their eldest daughter Marianne, 10, and nine-month-old son Willie. The couple had two other daughters; Margaret Emily (known as Meta) and Florence Elizabeth (Flossy), with a fourth, Julia Bradford, arriving the following year. Marianne contracted scarlet fever during the trip and although she survived, the illness killed her baby brother. As a natural storyteller, she took up novel writing on her husband’s suggestion to distract from her own sorrow. The subject of death, including that of children, is at the heart of Mary Barton, published anonymously in 1848, and Gaskell wrote that she “took refuge in the invention to exclude the memory of painful scenes which would force themselves upon [her] remembrance”. It was to Dickens the humanitarian Gaskell had earlier turned for help on meeting a dressmaker, Pasley, who had fallen into a life of destitution after being seduced by a doctor. The Bleak House novelist had set up Urania Cottage in Shepherd’s Bush with wealthy philanthropist Angela Burdett Coutts in 1847, offering to rehabilitate ‘fallen women’ and Gaskell inquired as to whether he could help the young girl emigrate. Pasley was later to inspire the central character in Gaskell’s second novel Ruth. Many Victorian readers, including members of her husband’s congregation, judged the 1853 story of an unmarried mother (a dressmaker’s assistant) immoral. 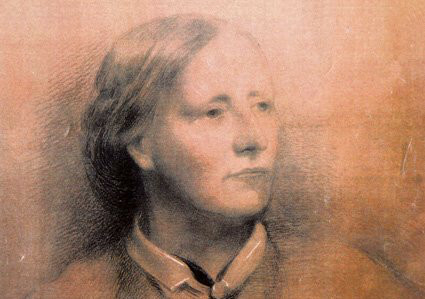 Even Gaskell would not let her own daughters read it, telling a friend Ruth was “a prohibited book in this, as in many other households”, and recalling in another letter how two men had burnt their copies in outrage. The mixed reception soon made her ill with what she dubbed “Ruth fever”. Manchester was very much part of the Victorian intellectual scene during Gaskell’s lifetime and the author hosted a wealth of famous faces at what is now 84 Plymouth Grove after the family moved there in 1850. Regular visitors included Dickens and Charles Hallé, founder of Britain’s longest established symphony orchestra, who gave Marianne music lessons. Charlotte Brontë stayed three times, hiding behind the curtains from other guests on one occasion because she was so shy. Manchester Historic Buildings Trust, whose patrons include Cranford actress Dame Judi Dench, has spent £750,000 restoring the outside of the Regency-style villa to its former glory and on interior structural work. The property also won a£1.85m grant from the Heritage Lottery Fund towards the restoration of the Gaskells’ House. Today, the city now claims the author as its own, with the circular Manchester Central Library and the John Rylands University Library both housing collections of her manuscripts, letters and personal items. In 1849, William Gaskell became chairman of the beautiful Portico Library, which still holds records of the books he borrowed for his family (women were denied membership). However, the truth is that his independent wife was happier when she was away from Manchester. She was a prodigious traveller, heading abroad most years and making regular visits throughout Britain to places such as the Lake District, Wales and London. She set her 1863 historical novel Sylvia’s Lovers in Whitby on the north Yorkshire coast, but was particularly fond of retreating with the family to the village of Silverdale by Morecambe Bay in Lancashire and daughters Meta and Julia built a house there after her death. While Gaskell often enjoyed the company of one or more of her four daughters on these trips, her husband preferred to holiday alone if he did indeed leave Manchester. She revealed in one of her many engaging letters that he liked the city “better than any other place in the world”. She, on the other hand, hated the smog and was “always longing for the country”, escaping either to find a quiet place to write or simply a change of scene. The rural landscape she craved was inspired by her Cheshire childhood and Knutsford remained in her heart, becoming the model for Hollingford in her expansive love story Wives and Daughters. The nearby country estate of Tatton Park, now a popular National Trust property, also appears as the aristocratic Cumnor Towers. The novel, which was serialised in publisher George Smith’s Cornhill Magazine, is widely regarded as her masterpiece yet the ever-busy Gaskell set herself a mammoth task writing it, juggling meeting publishing deadlines with furnishing a property at the other end of the country. Unbeknown to her husband, she had bought a house – The Lawn – in the Hampshire village of Holybourne “for Mr Gaskell to retire to” and as a home for single daughters Meta and Julia. But the writer, who penned countless short stories throughout her career, never got the chance to reveal her secret to William. On 12 November 1865, she died suddenly of heart failure while having tea with Meta, Florence and Julia. Gaskell was buried at Brook Street Chapel, which is now Knutsford’s oldest place of worship. Although her sixth and final novel, Wives and Daughters remained unfinished, it was later published posthumously in 1866.